I love potato pancakes. 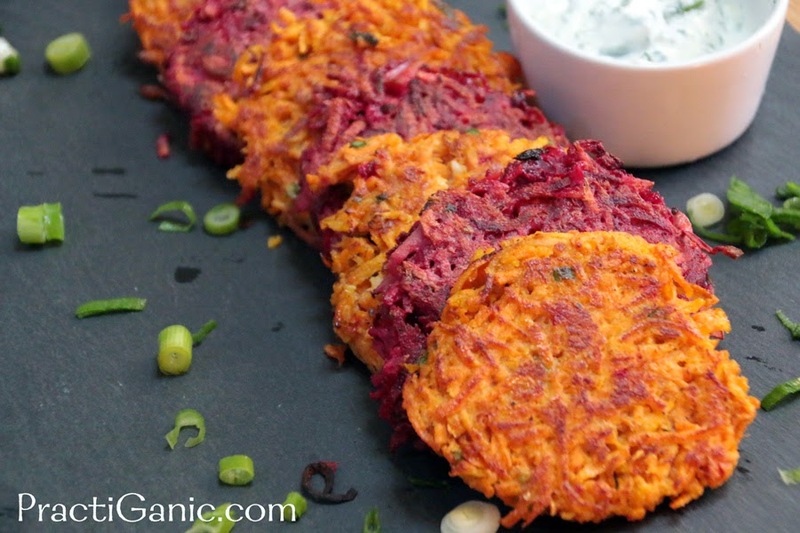 They are easy and quick to make which is perfect when I need a side dish and am coming up short on time and ingredients. The other night, the kids were begging me for french fries at dinner. Usually this isn't a problem, but they just had potatoes for lunch so I wanted them to have a different vegetable or more vegetables at least. We were having soup for dinner, which I knew that they wouldn't eat a lot of so I decided I would make potato pancakes as a side and probably most of their meal! Of course, once I started I got really into it. 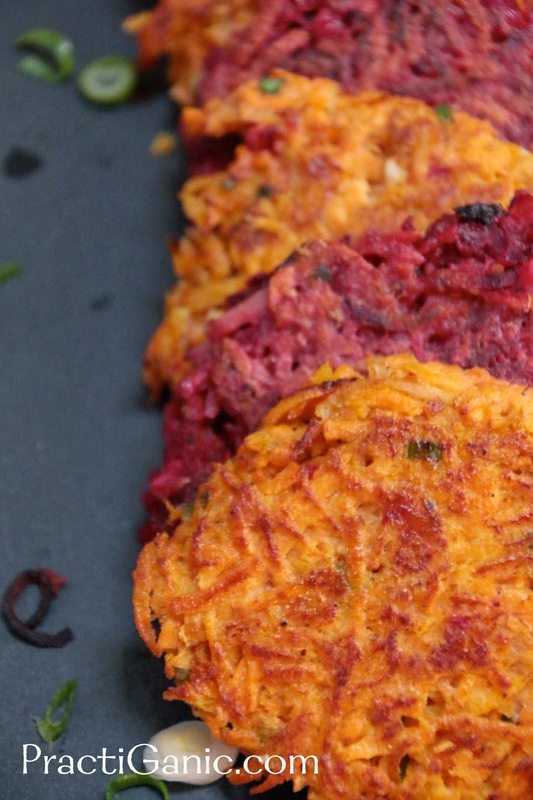 My excess of beets and carrots were calling me from the fridge so I ended up making not one, but two versions of potato pancakes. Amazingly enough, making both types didn't take that long since I just shredded one veggie after another. The ingredients I used for both pancakes were pretty similar, but there was a little highlight flavor in each of them to make them taste totally different. Not only did the kids eat them up, but they didn't even mention french fries! I told them they had purple potatoes and orange potatoes. They were thrilled! 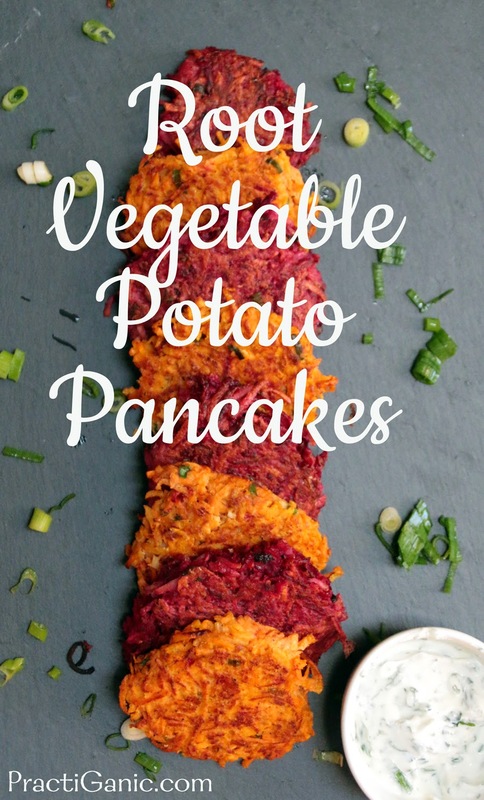 If you like these, you'll love my Veggie Potato Pancakes too! Mix all ingredients into a bowl. Heat oil in a pan. Using a 1/2 c scoop, divide your pancake mix into four pancakes. Fry on each side about 4-5 minutes each of until golden brown. Mix all ingredients into a bowl. Heat oil in a pan. Using a 1/2 c scoop, divide your pancake mix into four pancakes. The batter is extra runny so make sure you squeeze out the extra liquid before putting them in the pan. Fry on each side about 4-5 minutes each of until golden brown.